Do you have an exemplary project using buildingSMART openBIM solutions? A completed submission form should be emailed to websupport@buildingsmart.org If successful for Stage 2, you will then receive access to a folder via an email to upload your evidence in accordance with the submission guide. "It’s an opportunity for companies to showcase their application of buildingSMART open standards and solutions as it applies to current challenges of interoperability faced during collaborative project delivery or asset operations". The award was given for the first time at the international summit in Toronto in October 2014. View past projects for 2018 here and previous to that here. buildingSMART encourages the resubmission of projects to the awards program. In some cases, the past submission may not have fully demonstrated the accomplishments, or the project may have further advanced since the time of the last submission. Does the project have to be completed to qualify for award consideration? No. However the BIM Use Case being demonstrated for receipt of an award must have been completed. Can the proposed project be in pre-planning phase? Yes. If you have a completed BIM Use Case that can be demonstrated, you are welcome to submit your project for consideration. Can we submit a project completed more than 2 years ago? Yes. If you feel the project has merit and will be competitive with other submissions, you are welcome to submit your project for consideration. Will projects that were submitted in previous years for the awards program be eligible? Will projects that have been submitted to Chapter awards programs (including winning projects) be eligible? Are the projects required to show successful IFC workflows? No. While we greatly encourage the showcasing of successful IFC workflows, the awards program is for any user experience of buildingSMART open standards, tools and products. Can a submission identify real world challenges with the use of IFC? Absolutely! We encourage all well-documented experiences with all buildingSMART standards, tools and products. 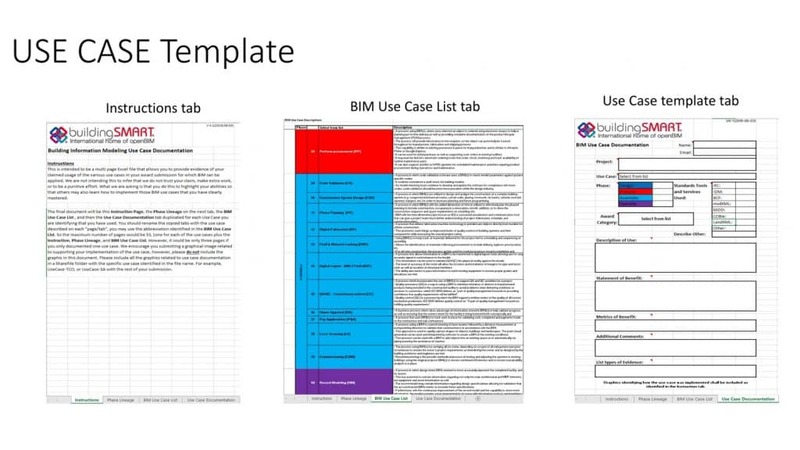 This is intended to be a multi-page Excel file that allows you to provide evidence of your claimed usage of the various use cases in your award submission for which BIM can be applied. We are not intending this to infer that we do not trust your claim, make extra work, or to be a punitive effort. What we are asking is that you do this to highlight your abilities so that others may also learn how to implement those BIM use cases that you have clearly mastered. To view the Use Case Template - click here. Any form of information that can demonstrate a BIM Use Case. What types of evidence are NOT acceptable?